Booth Classic : A Future Gem? David Etheridge looks at the products from British luthier Martyn Booth, who’s developed an impressive reputation through his Classic models. You may wonder occasionally who are the designers responsible for classic guitars . The headstock may say Brand X. but perhaps just one person may be responsible for a highly regarded, even pivotal design. While it’s obvious just from the name that X’s ‘name guitarist’ model had some input into the design and specs from the player involved, very often the person behind great instruments may be largely unknown outside of manufacturer X’s doors. So let me introduce you to Martyn Booth. He originally worked for Gibson in the UK before moving on to Yamaha in the 1980s as their guitar specialist. As such, he was responsible for the MSG/Image range and co-designed a guitar for Martin Taylor which was used as the basis for their AEX1500. 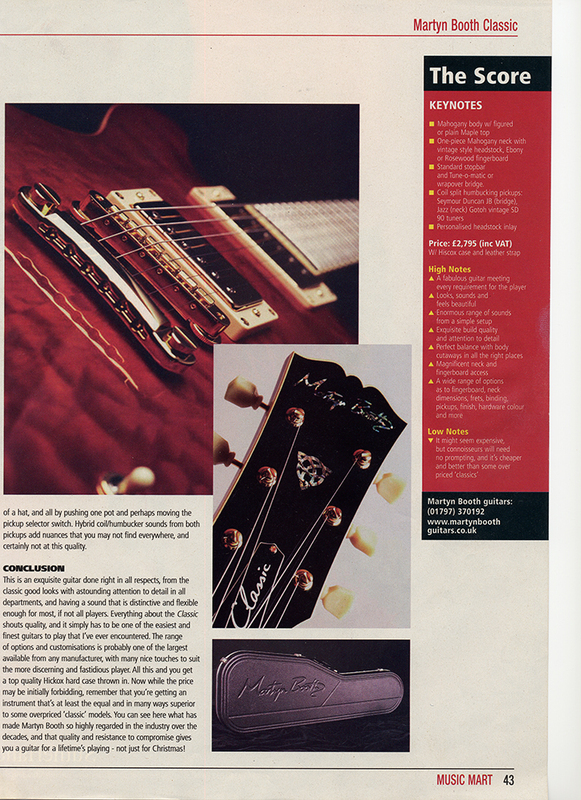 In 2002 he decided to go it alone with the Martyn Booth range starting off with the Classic and quickly followed by the Signature guitar. Martyn Booth guitars are built using traditional methods but with the same no compromise approach that has marked his career so far. This month, I’m looking at the Classic model. The Classic takes as its inspiration the iconic 50s design of a double-cutaway semi-acoustic, but here configures a small solid body: only 2” thick and 13.5” wide. The body is a solid slab of carefully selected Mahogany with the choice of a hand-carved figured or plain Maple top. The one-piece Mahogany neck is set into the body and has a vintage-style headstock with custom inlay. One of the main features of the Classic range is the huge number of options available: Rosewood or Ebony fingerboards, neck dimensions and fretwire, inlays, binding, pickups, finish and colour and even hollow chambers in the body to reduce weight and modify the acoustics. My review model featured a chess pawn motif on the headstock, a Rosewood fingerboard, and a Tusq top nut. The binding is unusual on the body: the deep cream colour is actually the body edge of the maple top, which involves some very precise and involved carving. Needless to say, the result is superb. Standard cream binding is used on the neck and headstock. The front of the latter can be Ebony or Rosewood (the former on my review model) and dots and inlays can be MOP or Paua Abalone to taste. These are of the finest quality. Gotoh vintage tuners, a choice of fretwire, Stopbar and Tune-o-matic or wrapover bridges (the latter on this model.) Pickups are Seymour Duncan’s finest: a JB on the bridge, and a Jazz on the neck. The electrics are unusual here with the familiar layout of single volume and tone pots and a three-position switch, to which is added a coil split humbucking option. Press down on the rear tone pot and the sound changes to single coil, eliminating the need to switch guitars on stage. This simple approach pays off well in the flexibility of tones on tap. There’s an ineffable quality about everything on this guitar. It just looks and feels so right throughout. The balance and weight are perfect with the thin body cutaway that fits perfectly around the stomach. The neck is pure magic, being true and beautifully proportioned throughout and so easy to play. The cutaway makes for easy finger work across all 22 frets to the point that you’ll find phrases that were demanding to play on other guitars seemingly fall off the fingers without effort. If there’s one thing the Classic is about, it’s tone. Warm and rich throughout, his guitar resonates wonderfully even when you play acoustically. When you plug in, the sound just grows and grows, it’s nuances faithfully captured by the pickups. At low gain levels the sound is pure jazz in tone, while at higher levels the sustain is warm and roaring. But the icing on the cake is the coil split facility giving Fenderesque tones at the drop of a hat, and all by pushing one pot and perhaps moving the pickup selector switch. Hybrid coil/humbuckers sounds from both pickups add nuances that you may not find everywhere and certainly not at this quality. This is an exquisite guitar done right in all respects. From the classic good looks with astounding attention to detail in all departments and having a sound that is distinctive and flexible enough for most, if not all players. Everything about the Classic shouts quality, and it simply has to be one of the easiest and finest guitars to play that I’ve ever encountered. The range of options and customization is probably one of the largest available from any manufacturer with many nice touches to suit the more discerning and fastidious player. All this and you get a top quality Hiscox hardcase thrown in. Now while the price may be initially forbidding, remember that you’re getting an instrument that’s at least the equal and in many ways superior to some over-priced ‘classic’ models. 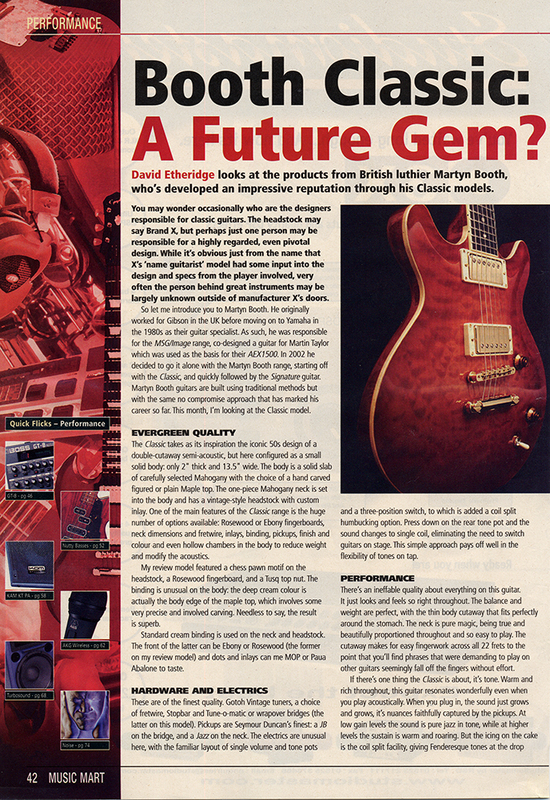 You can see here what has made Martyn Booth so highly regarded in the industry over the decades, and that quality and resistance to compromise gives you a guitar for a lifetime’s playing – not just for Christmas!